Cheshire Carriages have many years experience of repairing, maintaining and restoration of all types of horse drawn vehicles. 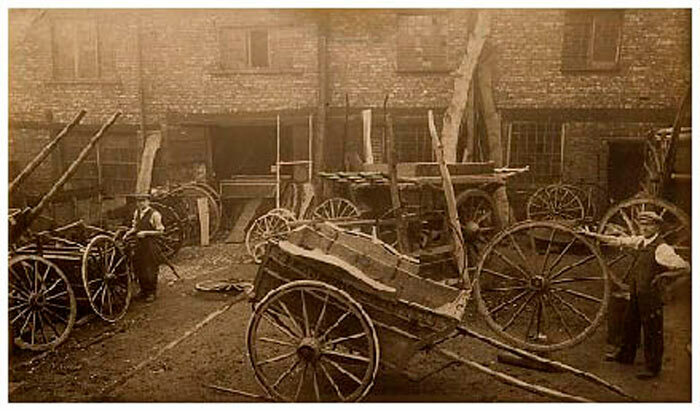 This picture shows the family business at around the turn of the last century. We have contacts throughout Europe in several countries, the German manufacturers for example have over 150 different models of horse drawn carriages to choose from. The better known models include Wagonettes, Phaetons, Broughams, Dog Carts, Landaus, Buggies, Gigs and many more. Our customers come from all over the UK, and are amazed at the work we can do to repair or restore their run-down horse drawn vehicles. We can arrange for collection of damaged vehicles from anywhere in the country, restore them to their former glory, and arrange delivery back to their owners. This also includes restoration of upholstery and paintwork, as well as general repairs. In our Salesroom you will find many horse drawn vehicles, these are mainly used or renovated models but there are also new models available. We've had many in our showroom including Marathon vehicles, Governess Cart, Victorian Rally Car, Ecton Carriages Gig, Landau and Wedding Landau, Bellcrown Comet Deluxe, Bellcrown Q4, Phaeton, Letley Gig, Six seater Brake Car, Randel cane sided vehicle, Bradford Gypsy Cart, Dutch MPV, Hillam 4 wheel exercise vehicle, Kuhnle Presentation vehicle and Pony Exercising and training vehicles. Some of these are recent and are still available. For more information and expert friendly advice about restoration, parts, consultation and sales, please contact us using our online form or by telephone 0044 (0)7881 825 455.